This is one of those things that you need just hanging around wherever you are. 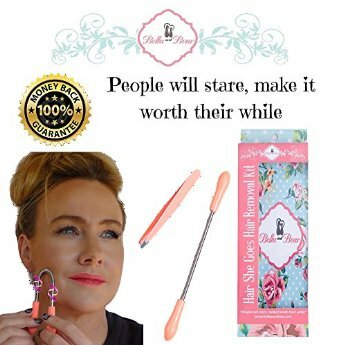 The Bella and Bear There She Goes Hair Remover tool is very unique, but in and of itself so simple. When you get it you first think how is this going to help me remove hair, it looks like a long sprint with two little pink ends. Here you can see in the picture it is rather like a long thin spring. It also came with an awesome pair of tweezers! So, you basically curve the spring while holding on to the two pink ends and then you put it up to wherever you want the hair removed and then lightly twist the ends in the same direction, what this basically does is catch the hairs in the spring and plucks them cleanly. It has a bit of an ouch factor, I am not gonna lie, but if the hair you are using it on is fine, it is pretty quick and pain-free. I liked that you could use it while watching TV, or hanging out, for the most part you don’t need a high-powered mirror and stadium lights to see what you are doing. If you want to do your eyebrows or something along those lines you will want to see a little closer. I have fine blonde hair along the sides of my face and when I put make up on you can really see it, so for me this worked great to remove those baby fine hairs without having to pluck each one individually. I also have a few pretty coarse hairs on my peri-menopausal chin that this worked on it just hurt a little more. This is one of those tools you want to have around so that you can get the hair before it gets out of control. You can do it quickly and efficiently without taking hours in front of a mirror with a pair of tweezers. I would recommend you give it a try, you will find that it’s an invaluable tool.